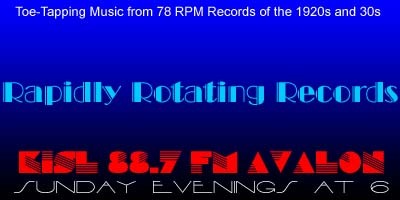 Welcome to Rapidly Rotating Records, bringing you vintage music to which you can't *not* tap your toes, from rapidly rotating 78RPM records of the 1920s and'30s. And…..we're BACK! The total replacement of my right hip went perfectly and I'm back climbing the stairs to the second floor studio and producing new shows. And on this week's brand new show we'll be celebrating the birthdays of Jack Crawford and Harry Link, we'll have just a little of a few different things, we'll celebrate the life of a dear friend and play some songs fit for a queen. And a fair number of this week's records are being heard on the show for the first time. Just A Little Kiss From A Little Miss – Jean Goldkette AHO / Lorin Schulz, Myron Schulz, Raymond "Pink" Porter, v.
Just A Little Bit O' Driftwood – The Harmonians (Selvin's Orchestra) / Scrappy Lembert, v.
Just A Little Flower Shop Around The Corner – Hal Kemp AHO / Skinnay Ennis, v.
If You See Sally – Ted Lewis and His Band / Ted Lewis, v.
The Queen Was In The Parlour – Rhythmic Troubadours (Percival Mackey) / Val Rosing, v.
Cross Your Heart – Roger Wolfe Kahn AHO / Henry Burr, v.
By My Side – Tom Gerun AHO / Frank Sylvano, v.
You're The One I Care For – Glen Lietzke's Midnight Serenaders / Glen Lietzke, v.
I'm Just Wild About Animal Crackers – Al Turk's Orchestra / Earl Hayden, v.
Hi Glenn – Thank you very, very much for your wonderful tribute to my Queen Sally. She is greatly missed by a lot of people. My gal Sal! You’re welcome, Mike. A small but heartfelt gesture on my part. Looking forward to seeing you on the 26th. Hip Hip Horray! Glenn we are jazzed you are back on the mend! Awesome show as all-ways! Wonderful tribute to Sally. And I cracked up over ” I’m just wild about animal crackers”! Thanks so much, Barbara! Glad you enjoyed it. Listening from Seattle…..always enjoy the music.